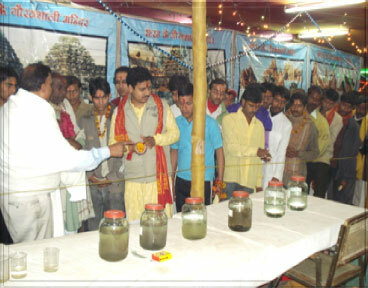 An environmental exhibition have been organised with objectives to create large scale awareness in the stark reality of Ganga water pollution & its tributaries., to build consciousness and an attitude to save environment from pollution in general and River Ganga in particular, to promote public participation and their cooperation in effort to reduce river pollution. In the exhibition all the matters related to Ganga & its tributaries water pollution have displayed through models, charts, sculptures, audio-visual sets, specimens etc. 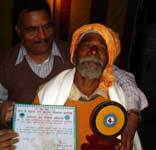 In tents and pandals, the legendary history of the holy river and the faith of the masses in it, are displayed through charts and models, quotes, craft, sculpture, specimen, Research findings etc. and seeps to arouse awareness on the growing pollution of the Ganga, in contrast with the pious faith of the massage in its holy nature and motivate public participation in activities related to keep the Ganga clean. The exhibition is based on following perspectives i.e. 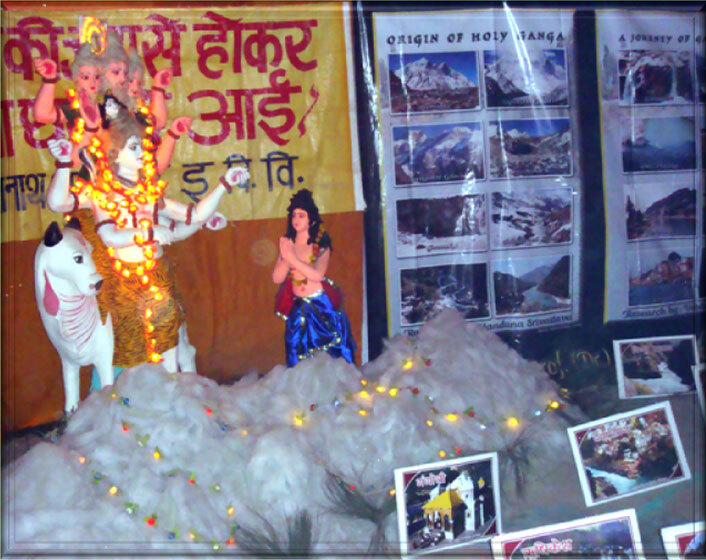 Disseminate religious, mythological, spiritual value of Holy River Ganga: It display story of mythological origin of holy Ganga, Geographical origin of holy Ganga, its tributaries, significance of Ganga in Indian culture, civilization, sociological, spiritual, mythological economical, national, literatures, epics, scriptures, holy cities of Ganga, fairs and festivals along the Ganga etc.to dessiminete the cultural importance of holy Ganga and arous religious sentiments to protect it. 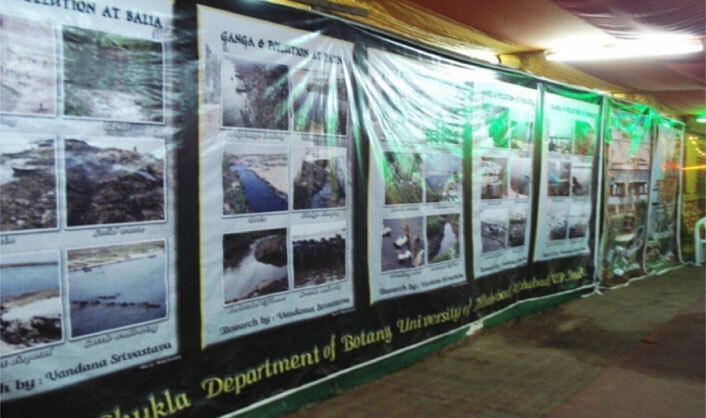 Present stark reality of Holy Ganga: Itt display stark reality of Ganga including its ecological status, pollution sources, impact of pollution on animal life, plant life as well as human life, government effort to reduce pollution problem of Ganga etc. 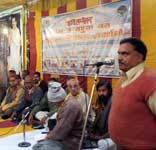 Role of Public participation: It display role of local people to keep Ganga clean. Mass awakening video- audio set up, documentary, slogans, literatures etc will be displayed to create consciousness about the protection of Holy River Ganga. 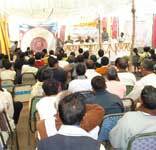 In tents and pandals, the legendary history of the holy river and the faith of the masses in it, are displayed through charts and models, quotes, craft, sculpture, specimen, Research findings etc. and seeps to arouse awareness on the growing pollution of the Ganga, in contrast with the pious faith of the massage in its holy nature and motivate public participation in activities related to keep the Ganga clean. 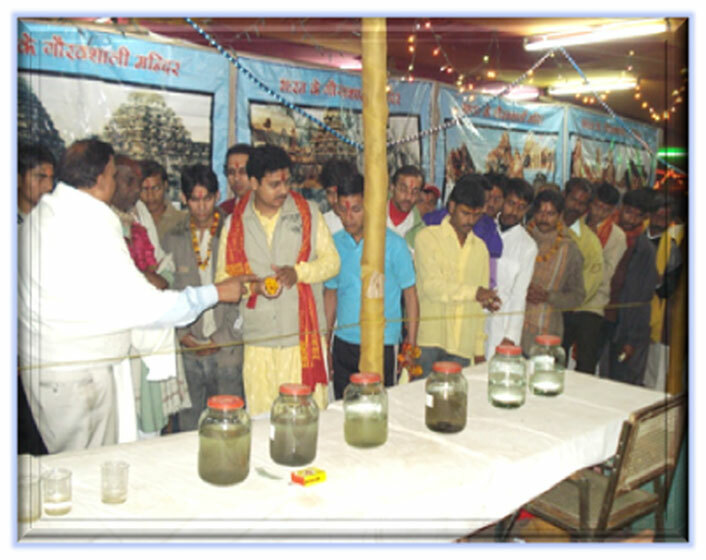 Exhibition display hall has been presented in six galleries to display holy Ganga in her different mode and concerning problems. First gallery fully dedicated to religious importance. 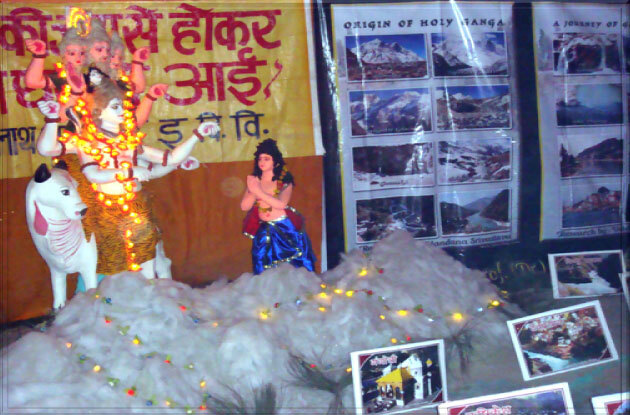 Mythological origin of holy river Ganga have been presented by sculpture and its holy cities , temples and fair & festival also displayed to arouse religious sentiments in local people. Next gallery shows value of holy Ganga for Indians in view of cultural, social, economical, ecological, mythological, scientific and national integrity. 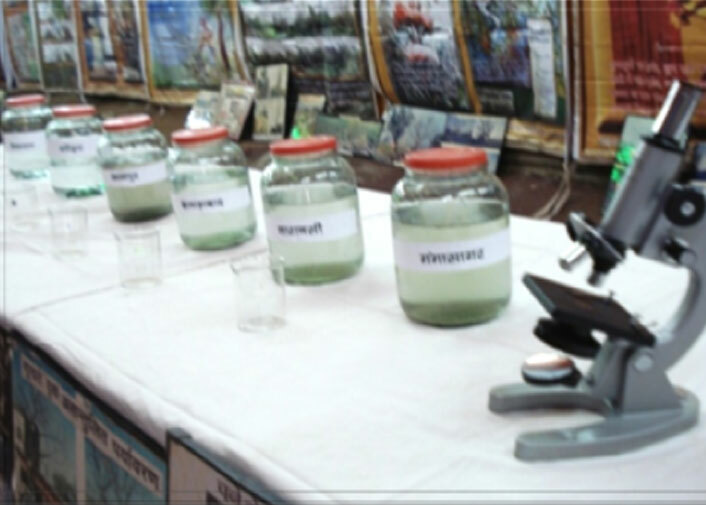 Third & fourth gallery presents problems related to holy River Ganga like pollution and its source, exploitation of biological resources by a large surface model which emphasis where problem exist. 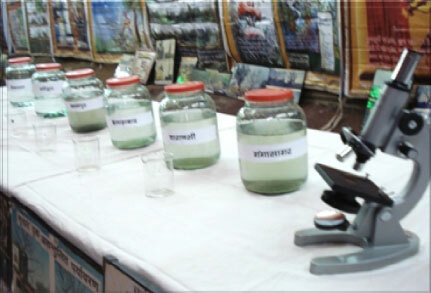 To collect current data and to check the suitability of River water for community use, an extensive ecological survey and water quality analysis (through out year) have been carried out and analyzed in Laboratory. During environmental talk with local citizen and in exhibition, we displayed these stark realities of Ganga water and about losses if the life line of India becomes polluted. 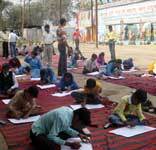 We try to motivate them for their active participation to save and protect their water resources. Sculpture of Dolphin, Turtle, Crocodile, Ghariyal etc. have been displayed to tell about our relentless activities makes these animal under threat now they need our help for there existence. 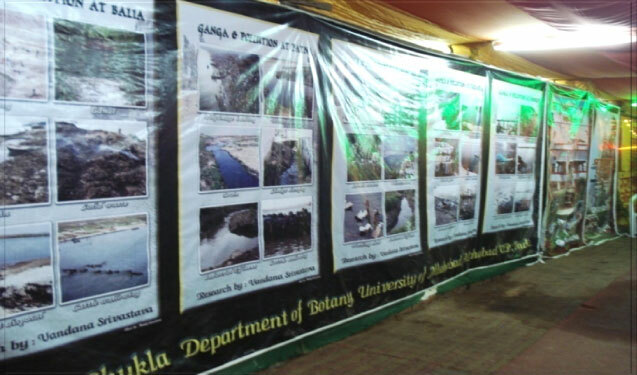 Impact assessment of environmental pollution and Ganga pollution has been well presented in gallery fifth. 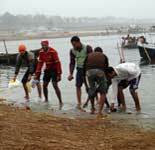 Gallery six presented cleaning effort through various points and motivate local people in effort to keep Ganga clean. 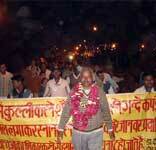 Various slogan, mass awarening statements, saint sandesh, etc. have been displayed also.